Thomas William "Bill" Hader (born June 7, 1978 in Tulsa, Oklahoma) is an American comedian, actor, voice actor, producer and writer. He is best known for his roles in Saturday Night Live, Cloudy with a Chance of Meatballs, Superbad, Hot Rod, Tropic Thunder, Adventureland, Paul, Forgetting Sarah Marshall, Night at the Museum: Battle of the Smithsonian, Inside Out, Star Wars: The Force Awakens, The BFG and as adult Richie Tozier in It – Chapter Two. He is married to Maggie Carey in 2006 and they had 3 children. Harder and Carey separated in 2017, Hader later filed for divorce several months later in December 2017. The divorce was finalized in 2018. 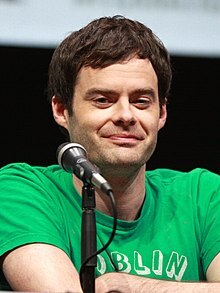 ↑ Gene Triplett, "Funny things about Bill Hader: Growing up in Tulsa as ‘movie nerd' gave comic actor material," The Oklahoman, August 17, 2007. ↑ Michaud, Sarah (October 12, 2009). "Saturday Night Live's Bill Hader Welcomes a Daughter". People. Retrieved November 18, 2014. ↑ Marquina, Sierra; Brown, Brody (November 18, 2014). "Bill Hader, Wife Maggie Carey Welcome Third Child, Baby Girl Hayley clementine Hader!". Us Weekly. Retrieved November 18, 2014. ↑ Corrison, Michele; Jordan, Julie (November 17, 2017). "Saturday Night Live's Bill Hader and Wife Maggie Carey Are Divorcing -". People. Retrieved April 1, 2018. ↑ "Bill Hader Reaches Divorce Settlement with Ex-Wife Maggie Carey". PEOPLE.com. Wikimedia Commons has media related to Bill Hader.